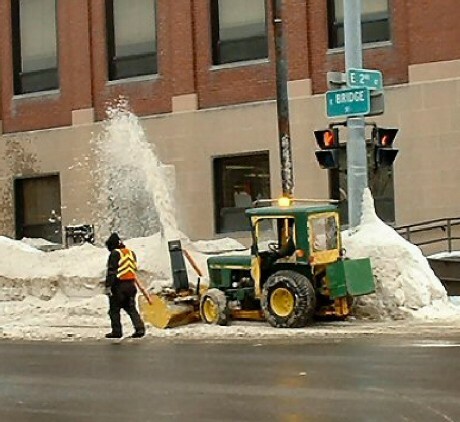 Workers clear snow from the sidewalk at the East Second and Bridge streets area during a previous winter. OSWEGO, NY – At its meeting Tuesday night, the Common Council approved amendments to the Code of the city of Oswego Chapter 249, Vacant and Occupied Property Maintenance Ordinance, Section 249-9, Cleaning of public Sidewalks. The vote was 5 – 1 – 1 with Councilor Shawn Walker voting no and Councilor Connie Cosemento was excused from the meeting. Prior to the meeting, a half dozen residents spoke at a public hearing regarding the change and highlighted the pros and cons of trying to keep sidewalks cleared during an Oswego winter. One of the changes is residents must clear snow from their sidewalks “by 7 p.m. of every day that any snow … may be upon same.” The old time was 10 a.m.
Judy Coniski told the council about how hard it is for her to keep the sidewalk around her residence clear of snow. Mike Goldych pointed out that people with sidewalks still have to shovel; those without sidewalks don’t have to. It doesn’t seem quite fair, he noted. “Now, come on. Think about this. The city has a responsibility to treat everyone equally,” he said. Steve Poydock, a West Fifth Street resident, served on the committee that examined possible changes to the ordinance, said he feels it is his civic responsibility to clean his sidewalk. There are many residents who comply with the ordinance, but the DPW snowplow crews deposit more snow (from the roadways) back on the sidewalks when they plow, he said. The changes in the ordinance should make it easier for those people to comply, he explained. There are some people who just don’t shovel their sidewalks, Nancy Krauss pointed out. “It’s not fair. It’s not safe,” she told the council. If people get money from a property, they should have to take care of it, she said referring to landlords (and businesses) who don’t ensure the sidewalks around their properties are cleared. “It should be addressed. But, unless somebody complains, it’s not addressed,” she said. Judi Kenefic echoed those sentiments. She said she tries to keep the sidewalk at her home cleared because it is used by children going to school. But the sidewalk is adjacent to the road and the plows continue to push snow back on it, she explained. 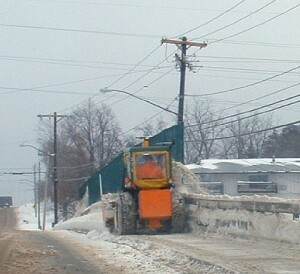 Snow is cleared from the sidewalk going over the East Albany Street Bridge. Alderman Ron Kaplewicz spearheaded the committee that proposed the revisions to the ordinance. He agreed that it has been a hardship, especially for people like the residents who live in areas such as parts of West Fifth Street near Oswego Middle School, where the sidewalks abut the street and frequent snowplowing activity by the city makes it nearly impossible to keep the sidewalks clear of snow and slush. The amendments aren’t a perfect solution, but are a step in the right direction, he added. “Right or wrong, either way, we needed to take some action,” he said. When the vote was taken and City Clerk Barb Sugar announced the resolution had passed, the large number of supporters in the audience applauded. In the event of a snow emergency being declared, the ordinance will be suspended until such time that the snow emergency is declared ended. Code enforcement is working on an educational piece to inform the residents about the ordinance. They are also attempting to develop a list of groups and organizations that are available to help those in need with snow removal.